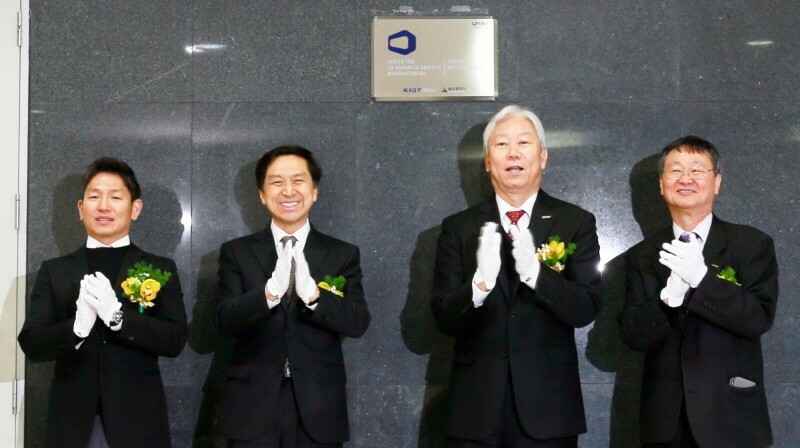 At the inauguration ceremony, (from left) Prof. Jeong Beom Kim, Mayor Ki-hyun Kim of Ulsan, UNIST President Mooyoung Jung, and Vice President Jae Sung Lee are clapping their hands in celebration of the center. The advancement of 3D printing and its impact on manufacturing have already been acknowledged by many industrialized countries. Indeed, a number of industries have been applying 3D printing technology to manufacture a wide array of items, from auto parts and prototypes to human skin and living organs. With the official launch of UNIST’s 3D Advanced Additive Manufacturing Center, 3D printing will become the city of Ulsan’s new future growth engine, following the bioindustry. An inauguration ceremony for 3D Advanced Additive Manufacturing Center was held in the morning of Friday, February 26th, 2016. The ceremony was attended by key officials affiliated with the center, including Mayor Ki-hyun Kim of Ulsan, President Mooyoung Jung of UNIST, Vice President Jae Sung Lee, and Prof. Jeong Beom Kim. The mission of the center is to promotes quality and innovative research in the area of 3D printing and to educate a new generation of manufacturing engineers and innovators skilled in their use. 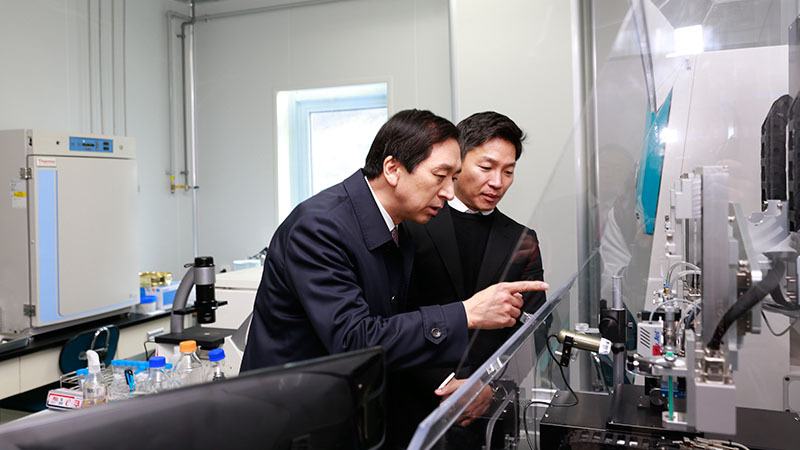 Mayor Ki-hyun Kim (left) is taking a tour of 3D Bioprinters during the inauguration ceremony for 3D Advanced Additive Manufacturing Center. In recent years, the center has undertaken an important R&BD project (Prof. Namhun Kim, School of Design & Human Engineering) under the suprvision of the Ministry of Trade, Industry & Energy (MOTIE) of Korea to produce eco-friendly 3D printed automotive parts. Moreover, it has also been working on the development of patient-specific 3D printed implants (Prof. Jeong Beom Kim, School of Life Sciences) under the supervision of the Ministry of Science, ICT and Future Planning (MSIP). UNIST President Mooyoung Jung states, “3D printing technology has an infinite amount of potential, as it has the capacity to create almost anything. However, there are still practical challenges for domestic companies to head into the arena of 3D printing technology.” He adds, “UNIST will implement a series of new measures that should help those companies to grow and prosper, thereby contributing to develop new growth engines in the community”. The ceremony was followed by a symposium on 3D printing technologies and applications to share knowledge about the future of additive manufacturing in different branches.